Urja Solar Energy is a clean, green and energetically colored solar energy WordPress theme. It is designed for solar panel manufacturer and distributor, Solar Panel Maintenance Company, renewable energy producer, recycling company, organic and bio-product selling stores, environment and nature protection non-profit organizations, nature and ecology conserving agencies and welfare community for the protection of forests, water bodies, earth and other elements of the environment. The theme can be used by people involved in organic farming and animal husbandry. Its design and use of colors, fonts, and images serve the purpose for which it is made in the most appropriate manner. It is easy to use and readily understandable to quickly set up an efficient site. Strong Bootstrap framework foundation further eases its usage. 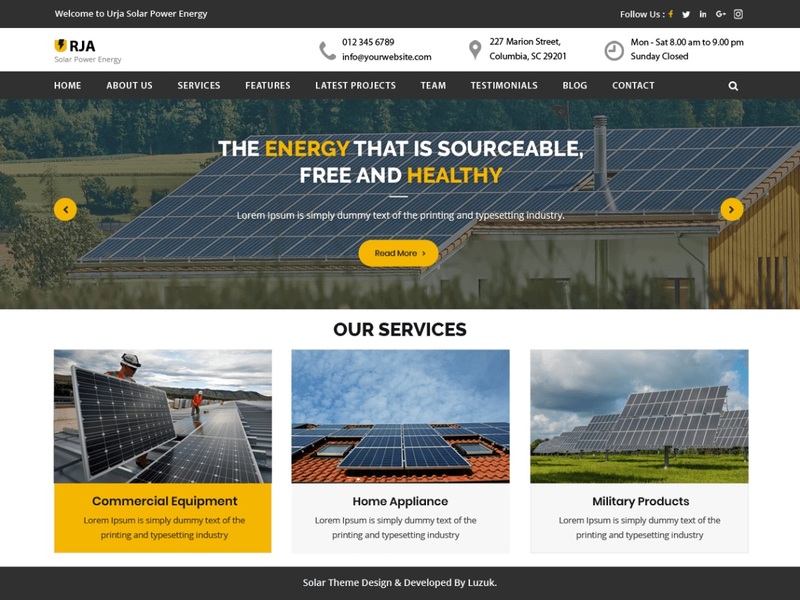 This solar energy WP theme is fully responsive, cross-browser compatible, translation ready and SEO-friendly fulfilling all the needs of a modern website. It uses banners and sliders to make the site all the more stylish. It is integrated with social media links to get better exposure for your site. This solar energy theme can be customized to change its look and feel through various elements. It is written in clean and secure codes leading to a bug-free site.